Everything you need to know about your hospitalisation and stay: registration, discharge and invoice. Where do you have to register? For ambulatory care, please go to at the day hospital registry (route 78). Registration order depends on the planning of your procedure or treatment. Please note that ambulance operators always have priority. Contact your medical insurance company if need be. Inpatients can go to at the main registry at the hospital entry. After signing in, you may wait in the waiting room with electronic number display. Registration order depends on bed availability. Please note that ambulance operators always have priority. Contact your medical insurance company if need be. Please note not to bring any valuables to the hospital or to keep them in the safe. We do not accept responsibility for the loss of personal property or valuables. If you or your family want to stay near the hospital prior to, during or after your visit, you can go to hotel Drie Eiken, located right next to the hospital. Your family can also stay at guest house Ter Weyde, also located closely to the hospital. When can you leave the hospital? Your specialist decides on the time of your discharge. In order to leave the hospital without his/her consent, you need to sign a declaration. Please note that your doctor knows best about our medical situation and will not retain you any longer than required. Before your leaving you will receive information about your medication, diet, activities, medical check-ups etc. You will also receive a brief medical report for your GP. A detailed report will follow soon. Arrange care at home if necessary. Contact one of our social workers on +32 3 821 37 00. Inform your health insurance fund if you are unfit for work after your hospitalisation. Ask your doctor to fill out the necessary forms before you leave. 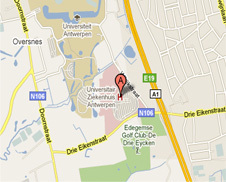 Rehabilitation close to the hospital is possible in Drie Eiken. When do you receive an invoice? About 6 weeks after your discharge you will receive an invoice with expenses for residence, medicines, surgical fees and personal expenses. You will receive an invoice for every period of 30 days in hospital. Do you have to pay an advance? Yes, in all other cases. The amount is individually determined and depends of the duration of your hospital stay and the medical intervention. Maybe. Some hospitalisation insurances require a franchise deposit, indicated on your payment commitment. If you feel that you need help communicating in Dutch, you may bring along a native speaking relative to the hospital. The Antwerp University Hospital may also consult a network of foreign language speaking staff, interpreters, the interpreting service of Antwerp and the telephone interpreting service Babel. To request an interpreter, please let us know in advance when scheduling your visit.